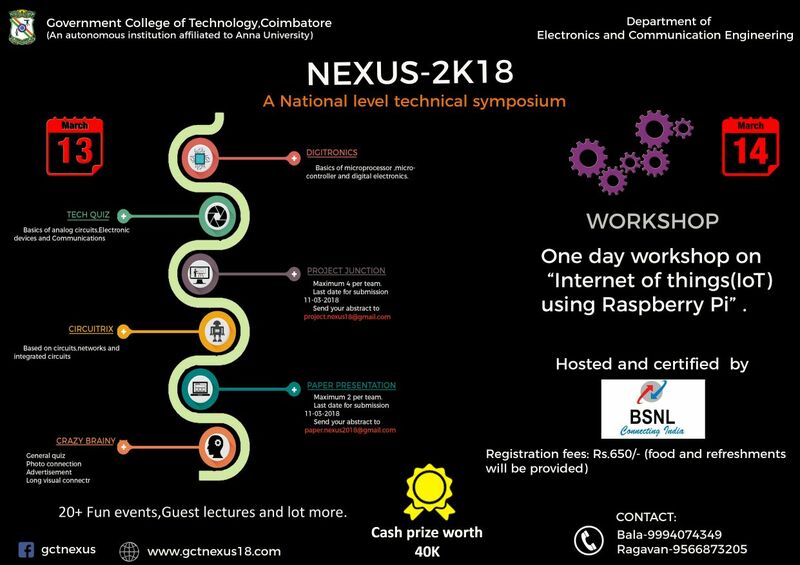 NEXUS 2K18 ,29th National Level Technical Symposium, Technological extravaganza where, is envisioned to be an edge where technology and excellence meet. Organize by Electronics and communication Engineering, Government college of Technology. ​​​1.Topics should be on Recent Trends in ELECTRONICS AND COMMUNICATION. ​​​1.Basics of microprocessor and microcontroller. 1.Open "GCT NEXUS" Fb page and post your photography. 2.No watermark will be used. 3.Prizes will be rewarded based on likes and judges decision. 4.Cash prize will be rewarded. 1.workshop on "Embedded System Design Using MSP430 "Hosted by Texas Instruments. Registration Fee: Rs 2500 for 3 or 4 Member with take away kit of MSP430. 2 ) Workshop on "Internet Of Things Using Raspberry Pi" Hosted and Certified by BSNL. ​1.Topics should be on Recent Trends in ELECTRONICS AND COMMUNICATION. ​​​2.Maximum 2 per team.